VENTURA — So much fun to watch, California sea lions have become a real attraction for visitors to the harbor — but they also cause damage to docks, and problems for marina operators and boaters alike. Since 1972, the National Marine Fisheries Service has been charged with protecting whales, dolphins, porpoises, seals and sea lions through the Marine Mammal Protection Act. The act was in response to many years of hunting whales for their blubber; and seals and sea lions for their fur. Since then, the population of California sea lions has recovered and more than 250,000 live and forage in the California bight and use the offshore Channel Islands for breeding. According to Ventura Harbormaster Scott Miller, on March 19, 51 sea lions hauled out on one of the floating docks at Ventura Harbor Village Marina. An adult female sea lion weighs about 250 pounds and adult males can weigh 600 to 1,000 pounds each. Miller explained that the docks are not designed to support such a heavy load. Last year, the Channel Islands National Park Service had a similar problem, with 30 to 50 males lounging daily on two of their boat docks, causing major tilting and other damage. The Park Service finally installed Seal Stop star-shaped devices that deter sea lions from getting on docks or boats. “At first, we tried installing a sprinkler system with a motion sensor. The park had tried this before, and it worked for a while. But when we installed one at the marina docks, the sea lions didn’t seem to mind and hauled out on the docks anyway,” Miller said. Like humans, sea lions can catch cold and need to haul out of the ocean to warm up or thermal-regulate their body temperature, an activity that is critical to their survival. For many years, sea lions created havoc for boat owners at Pier 39 in San Francisco Bay. Sea lions literally took over the docks. However, since the mammals drew so many visitors, the city removed some of the commercial and recreation docks and converted them into a series of specially constructed floats that could withstand the weight of 20 to 30 adult sea lions per float. “We looked into the cost of installing Seal Stop, and for about $6,000 in cost we could only take care of two fingers in the marina, “explained Miller. The cost of outfitting the entire marina would be more like $90,000. Currently the two floating finger docks that held the heavy mammals for several days are tweaked from carrying their excess weight. 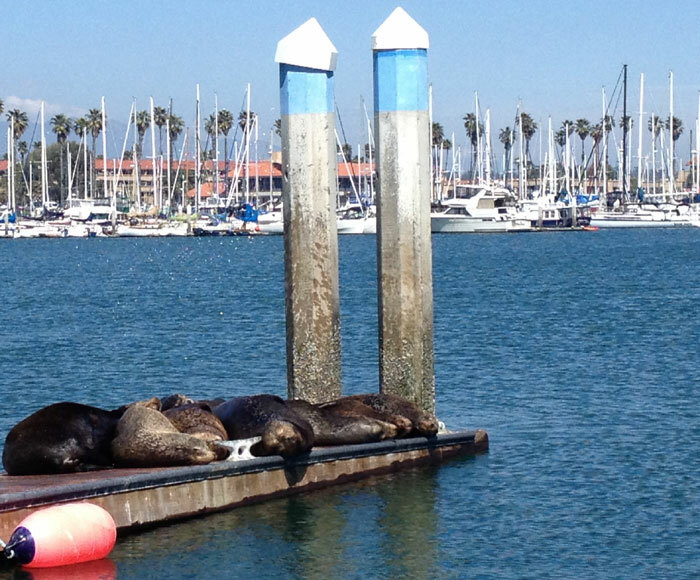 As of April 2, there were only a few sea lions on the marina’s floating docks. “Right now, the sea lions have left, for the most part. If they come back in large numbers, we plan to try erecting two by fours on the docks, making it less inviting or the animals to haul out,” Miller said. Concern for dock damage is one thing, but Miller is also worried about the personal safety of visitors as they ignore the barricades and caution tape harbor patrol officers erect to gain a closer view of the animals. The public is cautioned not to approach hauled out sea lions, as they are protected by law. Federal guidelines for both animal and human safety are to keep 100 yards distance on land and 50 yards distance in the water.